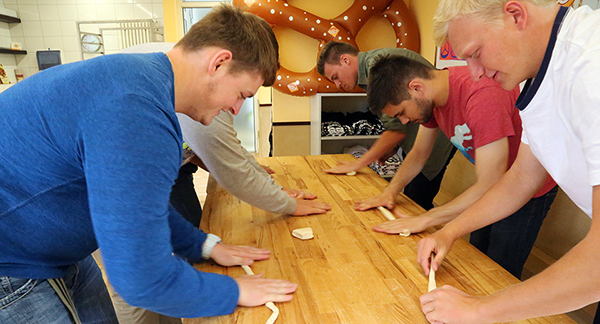 The Wabash guys got a fun break during the week learning to make authentic German pretzels. Erich Lange ‘19 – As we begin the second week of our trip, I have finally grown accustomed to the fact that I am actually in Germany. I am no longer in a classroom in Crawfordsville speaking German with nineteen and twenty year olds. For the first time ever, it has become necessary for my classmates and me to utilize our acquired German language skills in nearly every daily interaction — from purchasing a Döner Kebap at the corner store to asking a local resident for directions. Over the past two days of our immersion trip, our capabilities have continued to grow. 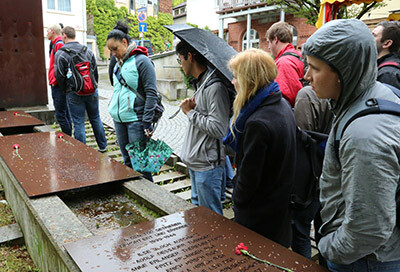 Students at the former site of the Tübingen synagogue. Unlike in the United States, the Monday after Pentecost is a holiday in Germany, thus we did not have “Unterricht”, or class, for the day. Instead, we worked on group projects on a topic of our choice. My group, in particular, did research on youth culture in Germany (specifically Tübingen). With the topics of our project spanning from music to politics to sports to modern slang, the best way for us to acquire the information needed for our project was to interview German students studying at the university in Tübingen. These interviews required us to not only use our German, but carry on a conversation regarding some pressing issues of the day — all in a foreign language. Yet, immersion learning is about more than just the classroom. That’s why Monday afternoon, Professor Tucker took us on a tour of the city with the specific theme of Jewish life in Tübingen. Of course, when talking about Jewish history in Europe, the Holocaust is unavoidable. After visiting a memorial dedicated to the Jews of Tübingen, we walked a little over a mile into what seemed to be a normal, residential neighborhood. However, if you stopped to look at the sidewalk, you could see small, metal plates embedded in the pavement. The brass plates are placed at the home of Jewish families and people who were deported in the Holocaust. On the brass plate is the name of who lived there, the year they were born, when they were deported, the camp(s) they were at, and if they were liberated or killed in the concentration camps. The moment of clarity for me was when I saw the plate of Ruth Marx, an eight-year-old girl shot and killed alongside her mother outside a concentration camp. Until then, the Holocaust had always been something distant and in the past. It was not until that moment in which I stood at the door of that little girl’s home, in the street in which she played, that I fully understood the Holocaust’s magnitude and depth. Wabash men learning the art of pretzel making! On Tuesday, class resumed in the morning. Former TA Elena Mezger never fails to make the class fun and enjoyable. In the afternoon, the students and faculty participated in a pretzel-making workshop at the “Gehr” bakery. There, we not only learned how to make authentic German pretzels, but also learned the history of pretzels and how they are tied in with the history of southern Germany. After the workshop, we had our third meeting with our Tandem partners. These meetings are a time for us to casually sit down with a German student and practice our German in a conversational sitting. This was perhaps the most fun evening thus far, as we are finally settling into using German on a regular basis, and could truly interact with the Tandem partners on more than just a superficial level. Yet, perhaps even more important than practicing German with our Tandem partners is the cultural awareness that the Tandem meetings give us — teaching us understanding and acceptance. This experience over the past ten days has truly been extraordinary, and I could not imagine having an experience like this were it not for the incredible opportunities Wabash offers. Immersion learning allow students to not only further develop their skills learned in the classroom, but learn the necessity of cultural acceptance and understanding, and what it truly means to think critically, act responsibly, lead effectively, and live humanely. David Mason ’18 – We began our weekend with a trip to Stuttgart on Saturday. About an hour north of Tübingen, Stuttgart is a bustling city with more foot traffic and geographical spread. Once we made our way through the city, we visited the Staatsgalerie art museum with its massive displays of both historic and modern art. We had approximately an hour and a half to view whatever interested us, with a small assignment attached. Professor Tucker asked us to describe, in German, two works of art that particularly interested us. This was a great exercise in applying the German that I’ve been preparing since I began studying the language my freshman year at Wabash. We had to describe the work’s appearance from the viewer’s perspective, a task that is not all that common unless you regularly study art. Describing visual art in words is already difficult, but doing it in another language is even more challenging. 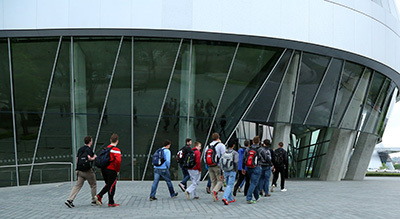 Over the weekend, students had the chance to visit a Mercedes-Benz Museum. While viewing the art was visually compelling, it was also a fun challenge to attempt to read and understand the complex summaries of the different exhibits in the German language. The gallery offered translations in English as well, but I enjoyed trying to see what information I was able to glean in German before checking the English. It’s always helpful and informative to see examples of how one says certain phrases in German. Reading difficult things like that improves your attentiveness and focus when reading; in other words, it is great for comprehension. Ronnie Posthauer ’15, a German major and Wabash track runner, met us at the gallery to hang out and see the exhibits with us. Ronnie has spent most of the last year working as an Au-pair in Dortmund, Germany. Naturally, he has been speaking German almost the entire time. Since graduation (the last time I actually talked to him was probably still when the spring semester of 2015 was at full-speed), his German has improved to what I would consider Native level. This means two different things: He sounded like a German when he spoke German, but he also sounded like a German when he spoke English. This was extremely puzzling initially, as Ronnie (despite the German-sounding last name) is quite American, at least according to the last time I heard him speak. He said that other people had pointed it out but that he doesn’t really notice. I’m glad I got to run into Ronnie and see the progress he’s made with his German, as it was proof that I too can achieve such a level of fluency. I heard recently in Germany that you know you’re an “insider” when people stop complimenting you on how well you speak the native tongue. Such must be the case for Ronnie. After the gallery, and then after lunch, we all trekked to Mercedes-Benz Museum. An architectural wonder, the museum was massive and featured a downward-spiraling eight-story chronological telling of the development and history of Mercedes-Benz from the late 19th century to the present time. Each level had car displays and plenty to read and learn about the technological advancements of the company. I particularly enjoyed, as at the gallery, attempting to decipher the German-language exhibits before reading about each presentation in English. I noticed an inconsistency between the German and the English displays: The German displays completely used the present-tense while the English used the past-tense. For example, the German version would say that in 1912, the Titanic sinks. But the English version says that the Titanic sank in 1912. This is pretty much an irrelevant inconsistency, but is interesting to know for students of either language. If there’s one important thing to know from this, it’s that the translations are not literal and are edited to flow the best according to each language’s patterns and forms. Both excursions within Stuttgart were great ways to view and learn about interesting topics that are relevant to the real world while also doing my best to follow along when reading German texts. By the time we were finished, everybody was exhausted. We quickly grabbed some dinner (for me, a Doener box with Rice) before many of us crashed. I stayed up a little later, but had no interest in going out. I have the sneaking suspicion that we are kept so busy on this immersion trip to prevent us from becoming too rambunctious and doing things that could get us into trouble. Even if that’s not the primary intention, it is certainly the effect. I say this only to emphasize that we are both staying busy and out of trouble, which may or may not be of interest to those who are reading these blogs. Professor of history Sabrina Thomas explains the Roman settlements in southern Germany. On Sunday, we went on a shorter excursion to Rottenburg, which is both closer to Tubingen and much smaller than Stuttgart. I had no idea what we were going to learn in Rottenburg, but that only made things more interesting. A quaint and small town, Rottenburg am Neckar sits atop a former outpost of the Roman empire. Archaeologists found a museum’s worth of artifacts, ranging from currency to large structures to dining utensils. Unlike the prior attractions, everything at the Sumelocenna museum was in German. This posed a greater challenge, removing the crutch of my native tongue and allowing me to try my best to decipher the meaning of each exhibit. There was a lot to read and take in, and plenty that interested me. Before exploring the museum, we watched a short film about the ancient civilization. To say that this video was a great exercise in listening comprehension would be an understatement. One can say that this entire trip is one giant reading and listening comprehension exercise. Once we finished visiting this museum, we had a brief lunch break. A bakery had earlier caught my eye, so I and two others went back to that bakery. I both love and fear those times where there is absolutely no other means of clarification besides asking the native speaker of German to repeat their sentence. It is utterly terrifying but also a confidence booster after the fact. One comes across many accents and speeds of speech, so that it seems like a huge feat simply to get through a meal in a different town. After lunch, we briefly visited the cathedral, which was a gorgeous structure in the middle of town. There was a solid mix of people visiting the church (probably mostly our group, looking back) and people actually performing prayers. This reminded me that travelling to new places is not simply some big museum experience of viewing old objects used by people who have no present connection to us. Rather, I felt that I was in a real place where people still carry on with their ordinary lives. I get a weird feeling whenever people visit my historic hometown as tourists. It’s a weird feeling, witnessing other people see your home as something out of the ordinary. I’m sure that’s similar to how the residents of Rottenburg am Neckar feel when tourists like us stumble through their streets on a quiet Sunday, speaking English and pointing at everything. 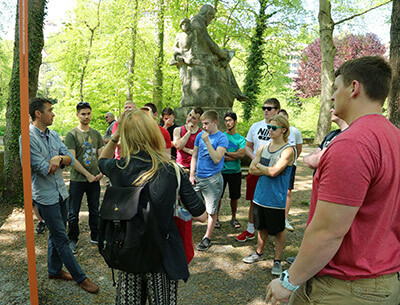 George Go ’18 – Over the past few days, we’ve continued our excursions in Germany. 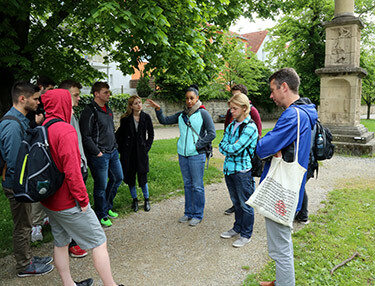 This included visiting the Bebenhausen Monastery and the Schloss Museum, as well as having the privilege of learning about Germany’s political system from Wabash alumnus Dr. Jared Sonnicksen ’01, who is currently a post-doc at the University of Darmstadt. On Wednesday morning, the group took a hike to visit the Bebenhausen Monastery. Although the trek up there a decent ways away, I think that I can speak for the majority of our group about how jaw-dropping the scenery of Bebenhausen was once we first arrived. Once we made our way down, we stopped and explored the monastery. 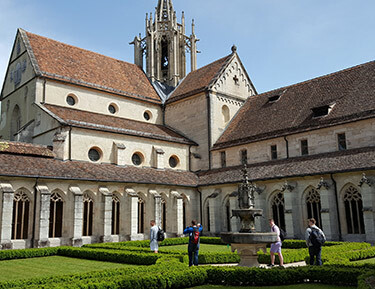 An interesting fact about the monastery was that it was originally Roman Catholic and then reformed into Protestantism. The monastery showed this to us when we took a closer look at the building’s unique architecture. The next morning we were greeted by Sonnicksen. After Wabash, he received a Fulbright to continue his studies at the University of Bonn with the help of a scholarship. He then taught English for 3 years, and struggled a little bit with the culture shift between Germany and America. Sonnicksen discussed how different the political system in Germany is compared to the United States. He talked, for example, about the Gewaltenteilung, or separation of powers. This included their parliamentary system being broken up into the Bundestag and the Bundesrat. Dr. Jared Sonnicksen ’01 explains the German political system. Later that evening, we took an excursion to the Schloss Museum of “Alte Kulturen,” or old cultures. In this museum, they have ancient artifacts dating back to around 40,000 years ago. These cover the time of the ice age and the cognitive revolution in human development, and they represent some of the earliest art objects every discovered. We were able to see first-hand ancient figurines of various animals carved out of Mammoth ivory and then discovered tens of thousands of years later in caves outside of Tübingen. The museum also included pieces of ancient culture from areas such as Greece, Italy, and Egypt. We saw things such as ancient ceramic art, swords and armor, and sarcophaguses throughout the museum. Towards the end of the museum, we got to see sculptures of Roman and Greek figures including the goddess Athena to famous war heroes such as Alexander the Great. Although it has only been the first few days of our trip, it is easy to say that we have seen a lot of interesting things thus far. Tyler Yoder ’15 – So with our last night in Chicago winding down, it is time to look back on our experiences today and throughout the week. Teaching this week in Chicago has been life changing in multiple ways, and I feel like all of us have taken home some valuable lessons. Even though I have already completed the student teaching portion of my licensure, I was still excited to get this new experience teaching in a large urban school. What I found is that there are tons of ways teachers can effectively instruct their students around the restrictions that teaching in an underfunded school district can bring. I’ve found that the passion that these teachers have for their students is beyond amazing, and it’s something that future teachers should absolutely look to for inspiration. Being in a school like this in practice is very different from simply discussing urban school in a seminar at Wabash. When you’re in the school, your words and your actions could have real world consequences, so the way that you try to bond with your students is incredibly important, and it could influence how students view you for years to come. Getting to eat dinner with some alumni in the area who are involved with schools nearby was an eye-opening experience. Hearing some of their stories about their practices, their schools, and themselves can paint a picture of what a successful teacher for an urban school looks like, and they have great advice for anyone willing to listen. Matt Scott ’17 – One of the biggest things that I believe happens to students upon arriving at their (Chicago) schools is the culture shock. However, that isn’t the case for me. I went to a school that was similar with a large amount of black students who enrolled. It wasn’t as large of a number as Kenwood, but it was very similar. Going into the first day, I knew pretty much what I was getting into and knew that there wasn’t going to be many surprises. However, one thing I noticed is that there isn’t a lot of disrespect to the teachers as I thought there would be. My high school had students who didn’t care who was the authority figure and disrespected almost everyone in the building. I think another thing that I was expecting based off my own personal experiences was that there would not be many students who really care for their education. While that may be true, there are also many students who truly care about being in class and working hard to get a good grade and hopefully obtain entry into a college. It is hard to see because there are indeed many students who are there just to get by, but hidden amongst those students are students who truly hang on every word of their teacher and strive for success. If I could offer some advice for the students who are coming next year, I would make sure that you are fully invested in being in a place and school so much different from your own. Even though you may think you have an idea about what school will be like, it is likely that it will be so much more different. Enjoy the city and life that most are probably not accustomed to because it may change the way you view the city and city life. Finally, enjoy teaching with the kids and host teacher. You may not know it yet, but there could be a possibility you end up back in the CPS system, or working in a school you never would think you’d want to work in. Kyle Morgan ’17 – Teaching at Kenwood Academy High School has been incredible because it has been unlike any other teaching experience I have ever done. I have had the opportunity to teach classrooms that have more diversity than any other classes. My host teacher teaches African American History, which is something I have limited experience in. 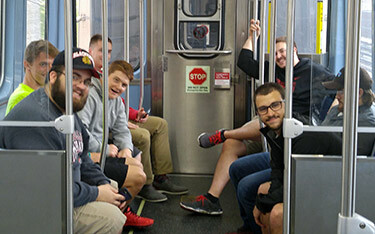 Another new experience for most of the guys was public transportation. I will openly admit I was nervous about teaching in a school that is more than 90 percent black because all of my teaching experiences come from rural areas in Indiana and Illinois. Yet, I can honestly say that my Wabash education fully prepared me for the challenges. On my very first day I led discussions on stereotypes facing urban students and specifically African American males. This led further into discussions about what students here in Chicago know about rural Illinois and the stereotypes that exist about where I come from. From there, we as a class explored solutions that could possibly help solve those problems. My students had the opportunity to learn about my background as well. I told them that I have little experience with diversity but was very excited to learn from them as well as teach them things that I know. They were very receptive and open to my experiences and what I bring to the classroom. I know my host teacher was very excited to have a young teacher in her classroom, and I brought a new way to connect with students, who I am not that much older than. This has been an incredibly rewarding experience because not only have I experienced a new classroom setting with a fresh set of challenges, but I have enjoyed doing it. I have received so many wonderful compliments from students and teachers at Kenwood, which has made my experience worth it. This experience has reassured me that I want to teach children someday and maybe even here in Chicago. Patrick Myers ’17 – When getting into to Chicago I had no idea what to expect. I had doubts about the hostel and also the school that I was placed in. The teachers and students in the CPS schools are similar yet different from the ones that are in my hometown. Curie Metropolitan High School has roughly 3,000 students, and Hispanic students make up 90 percent of the student body. There are also 22 history teachers in the department, and for the most part they get along with one another and collaborate well together. Another part of the cultural experience is trying new cuisine. The classroom setting and students were much different from what I expected. I expected the class to be a mess and not safe, and for the students to be very loud and not well behaved. Well, I could not have been more wrong about my expectations. The students were very well behaved, and responded well to me being in the classroom and were willing to ask me questions about my education and where I was from. Most of the teachers that I have observed created a good classroom atmosphere and the students responded well to the teachers’ actions and how they handled the classroom. The urban education experience, so far, is something that everyone at Wabash should have the opportunity to do. So far, this trip, has given me a new perspective on how education can reach different ethnicities in the classroom. Also, being a white teacher in a predominately Hispanic and Black classroom is something new that I had to face. I thought that I would have a very difficult time connecting with the students, but I actually had no problem with the students and they respond well to my questions. The advice that I would give future students is just take everything in and have a fun time, and do not go into the trip thinking that it is a waste of time. This trip has been amazing, and the school experiences have been even better. Harrison Schafer ‘17 – Though we have been in Tübingen for just two days, I’ve noticed significant differences not only from Wabash, but also other German cities. 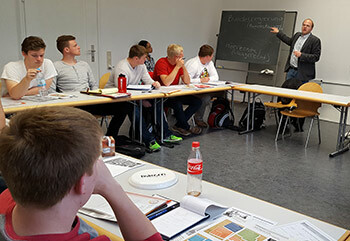 Professor of German Brian Tucker, at left, with students. Elena Mezger, a former Wabash language TA, and her brother Pablo welcomed us to their town with open arms, as well as with gifts of chocolate & pretzels. Our group immediately embraced the city. These first few days have involved quite a few hours of exploring the city. Our first stop was fittingly the building in which we would be learning on weekday mornings: the Neue Aula. 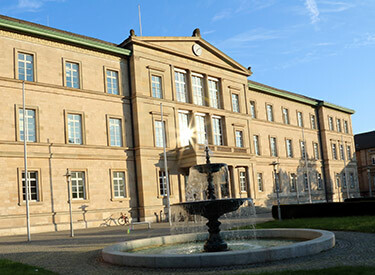 This lovely building houses classrooms for science and law, but it will be hosting our intensive German class for a few weeks. Unfortunately for the students studying here, they do not have the luxury of rolling out of bed and strolling right into Econ 101, all within five minutes; their university is strung throughout the town. Not too terribly long after our first stop, we ventured over to the Neckar, the major river, which cuts through the German city. While passing over the river, the group stopped to enjoy the quintessential picture of Tübingen and its slice of the Neckar. Shortly thereafter, we found ourselves strolling through the Neckar Island, enjoying the calm waters surrounding lovely scenes of Tübingen’s greenery. We were soon greeted by a daunting figure. Before us sat a large monument to Friedrich Silcher, a renowned nineteenth-century composer of “Volksmusik.” However, the artist did not sit alone. The group saw an odd juxtaposition of this German composer, fused with images of German soldiers. We learned that the Nazis in Tübingen erected this memorial in 1940. Utilizing Silcher’s music for the people, they sought to rally its citizens around passion for the war effort. As we wondered why such a statue would still stand today, Dr. Tucker and Dr. Thomas proceeded to explain; perhaps the German people chose to keep a reminder of the Second World War, creating a dual memorial: the statue itself, along with an informative sign to explain and contextualize the statue’s memorial function during the Third Reich. Neue Aula, at the University of Tübingen, where students are taking German classes. Photos by Mark Elrod ’99. We then broke into discussion; the group could not fully sympathize with the idea of keeping a memorial with such negative associations standing. Americans pride themselves on their patriotism, top to bottom. Surely, Americans would never keep a similar statue up, especially with the recent controversies surrounding Confederate flags. Fortunately for us, Pablo and Elena provided shared anecdotes about their German upbringing and about how Germany today still works to come to terms with its dark past: the frequent attention to the War throughout their education, the lack of German nationalism, etc. They talked about the new generation of Germans who are trying to balance the guilt of German history with a sense of pride for the role Germany plays in Europe today. As mentioned earlier, Tübingen is a college town. Students breathe life into this city; with some 30,000 students, the students of the university compose a third of Tübingen’s population. Whether you eat at an Ethiopian restaurant or a cozy cafe, you cannot avoid the German students. As I walked through the university’s Mensa (their Sparks, or student cafeteria), faces both young and old soon were enjoying the day’s meal. That typical lunch hour looked ludicrously similar to our Midnight Munch with a sea of students coming together at common tables and breaking bread. Fortunately, we get to play pretend for a few weeks and “attend” this prestigious university. With Elena as our hometown guide, we look to hone our German skills and perhaps fool a student or two into thinking we actually do study in Tübingen. Though we may be a tad more eager than our German counterparts in the Neue Aula, we have already tallied an effective three hours in the classroom, and I definitely look forward to more as I observe my progression over my two year stint studying in the German program. Cole Seward ’17 – The experience in urban education is second to none. After day one of teaching, I can say that all expectations have been met. It may have been cheating, but I made all my expectations after researching the school I was placed at. I assumed I would have primarily Hispanic students and a bilingual teacher. Something that did catch me off guard was the ease to interact with these students of a different culture. With each student, I tried to be as welcoming as possible and also answer any questions they may have had. Something I found funny was the students’ shocked expression when they realized I was a Spanish minor. I believe the last thing they expected was a student teacher from some small town in Indiana to know some Spanish and have a general sense of what the students or the teacher may be saying. Teaching in an urban setting is fun. I feel very comfortable because I came from a public high school where the culture was somewhat diverse. The biggest thing about teaching in Chicago is that my class is primarily Hispanic, which is something I have not experienced. It is a learning experience and is actually a great opportunity for me to work a little on my Spanish. There are a few students in each of my classes that do not speak Spanish, but they willingly spend their own time learning the language or at least some key words. My classroom was very open with a lot of discussion and focus on real world applications. I think my host teacher does a very good job of setting up a lesson plan for the day while keeping an open mind and tending to the needs of the students. That is where discussion can really be useful because the students can express their understanding of the topic and apply their own thinking to try and solve problems in different ways. Even though the experience in the classroom is great, the overall experience of the city of Chicago is very awesome as well. Living in a hostel is not bad at all and I would just classify it as a really big dorm building. Living with seven guys to one room is neat because it gives you a chance to connect with people from Wabash that you do not normally get to see. Also, experiencing the different cultures of Chicago is really cool, especially the food. It is a great opportunity to try new stuff and really put yourself out there. If you ever get the chance to take this class, take it in a heartbeat. 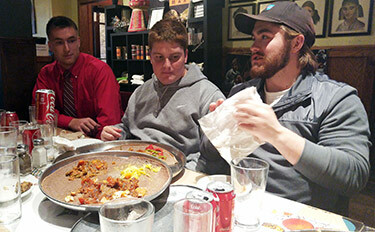 It offers cultural diversity and experience that not many other courses at Wabash can offer. It also gives you a chance to get an expense paid trip to see the “not-so-touristy” spots of Chicago. Tom Garrity ’16 – My first day at Wendell Phillips Academy High School was extremely hectic, especially relating to confusion about my placement in the early morning. My counselor, Ms. Kashual was giving an AP biology exam and was running around trying to find me a teacher willing to let me sit in on their class. After meeting my first teacher, Mrs. McMurray the atmosphere in the classroom was extremely different than my personal experience of attending a high school in a rural farm community. The energy in the classroom was at levels I had never experienced before. Mrs. McMurray, handled it in a very professional manner, and demonstrated her unique relationships with each of the students. Always maintaining respect from her students while keeping friendly conversations. Which was a big topic in multiple articles we read for EDU 330. Shortly after, I moved to Ms. Beans history class but not before I was in the hallway during passing period. We read multiple articles in class about the security and other areas that were different than what we had experienced, but being in the hallway during passing period was something that had to be experienced in person. Almost the exact moment that I turned while I was walking out of the door of Mrs. McMurray’s classroom, I looked to my left and thought a fight was happening. Five seconds later, the two students who I thought were throwing down, began laughing and joking. After that surprising incident, it was almost impossible to walk in a straight line to my next destination. Students were running after each other, and bumping into everyone, that was the first real sense of cultural shock that occurred, with that kind of behavior being the norm of the school. My advice to future students getting ready to experience an inner-city school setting for the first time is to be ready to go with the flow. The pace at the high school I was in was extremely fast, and you cant get caught up in making sure everything will go as planned, cause it won’t. However, getting ready to go into the second day of being in the school, I have a new level of confidence and also a new level of excitement.